NEW ORLEANS – Napheesa Collier had 26 points and 12 rebounds and top-ranked Connecticut held off Tulane 63-60 on Saturday night to push its record winning streak to 101 games. 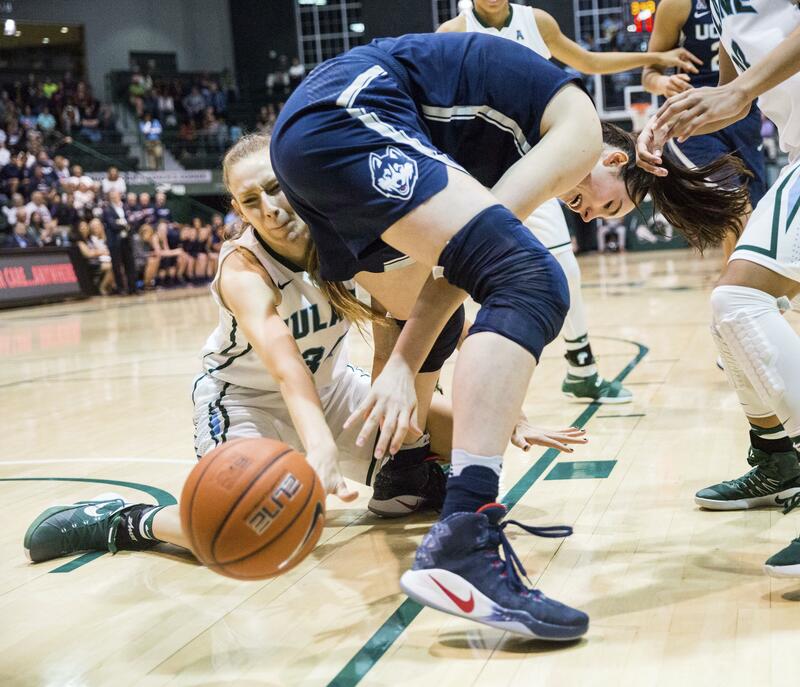 Katie Lou Samuelson scored 15 consecutive UConn points in a second-half spurt and finished with 17. Gabby Williams added 14 rebounds for the Huskies (26-0, 13-0 American Athletic). Kolby Morgan led Tulane (16-11, 7-7) with 19 points. Leslie Vorpahl had 16, and Tene Thompson 14. The Green Wave pulled within two points three times late, but could never get a defensive stop. Finally, they got the ball with four seconds left, but Thompson’s desperation 3-pointer fell short. NORMAN, Okla. – Peyton Little hit a corner 3-pointer with two seconds remaining and Oklahoma beat Texas to end the Longhorns’ 19-game winning streak. Little finished with 15 points for the Sooners (21-6, 12-3 Big 12 Conference). Vionise Pierre-Louis scored 21 points before fouling out, and Gabbi Ortiz added 14. Freshman Nancy Mulkey hit one of two free throws with 0.4 seconds left to seal the victory. Texas made a 3-pointer as time expired. Brooke McCarty scored 16 points for the Longhorns (21-5, 14-1). WACO, Texas – Nina Davis had a season-high 23 points along with 10 rebounds and Baylor beat Oklahoma State to move back into a share of first place in the Big 12 Conference. The Lady Bears (25-2, 14-1 Big 12) never trailed in their first home game since a loss Feb. 6 to No. 8 Texas. Along with Davis’ 30th career double-double, Kalani Brown had her eighth for Baylor with 19 points and 12 rebounds in 21 minutes. Karli Wheeler had 18 points for Oklahoma State (14-12, 4-11). Baylor, which has won the last six Big 12 regular season and tournament titles, plays at Texas on Monday night, one of three remaining regular-season games left for both teams. TALLAHASSEE, Fla. – Brittany Brown and Ivey Slaughter each scored 14 points for Florida State. Chatrice White added 10 points and 11 rebounds for the Seminoles (24-4, 12-2 Atlantic Coast Conference). They bounced back from losses to No. 8 Texas and Virginia. Danielle Edwards led Clemson (14-14, 3-12) with 11 points. FORT WORTH, Texas – Kindred Wesemann scored 12 of her 19 points in the fourth quarter in Kansas State’s comeback victory over TCU. Kaylee Page added 15 points for the Wildcats (19-8, 9-6 Big 12). Amy Okonkwo had a career-high 24 on 9-of-14 shooting and dded 10 rebounds for the Horned Frogs (12-14, 4-11). Published: Feb. 18, 2017, 6:36 p.m.